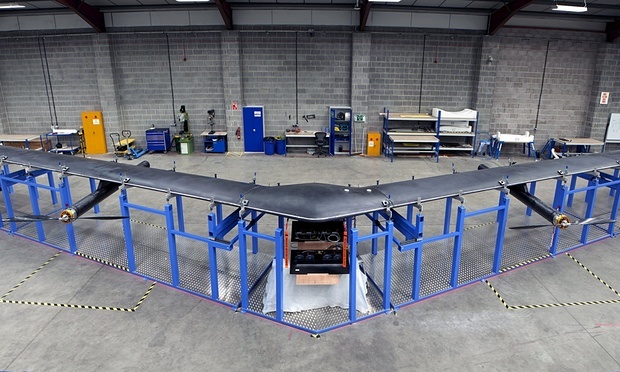 Facebook has revealed its first full-scale drone, which it plans to use to provide internet access in remote parts of the world. Code-named “Aquila”, the solar-powered drone will be able to fly without landing for three months at a time, using a laser to beam data to a base station on the ground. The company plans to use a linked network of the drones to provide internet access to large rural areas. However, as with its Internet.org project, Facebook will not be dealing with customers directly, instead partnering with local ISPs to offer the services. 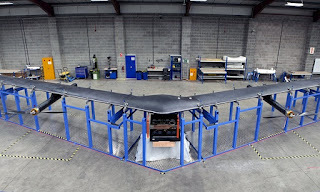 Facebook said it would test the aircraft, which has the wingspan of a Boeing 737, in the US later this year. Yael Maguire, the company’s engineering director of connectivity, said that the plane will operate between 60,000ft (18km) and 90,000ft (27km) – above the altitude of commercial airplanes – so it would not be affected by weather. It will climb to its maximum height during the day, before gliding slowly down to its lowest ebb at night, to conserve power when its solar panels are not receiving charge. Although Facebook does not immediately face policy or legal hurdles in testing its drone in the US, Maguire said, it was the first company to fly at such altitudes and had a team working with policymakers to help set guidelines. The drone, which was built in 14 months, was able to fly in the air for 90 days at a time, Maguire said. Lacking wheels, or even the ability to climb from ground level to its cruising altitude without aid, it will be launched with the help of helium balloons, which will rise it to its preferred height. The balloons will be easily capable of lifting the plane: even when fully laden with communications gear, it will weigh just 880lbs (400kg), less than a fifth of the recognisable Reaper drone used by the US military, even though the Aquila drone has a wingspan of 46 yards (42m), compared to the Reaper’s 16 yard (15m) breadth. Because the planes must constantly move to stay aloft they would circle a two-mile (3km) radius, Parikh said. The Aquila program, which was first tested in Britain in March this year, is geared towards bringing internet access to the 10% of the population who do not have it. It faces competition from a similar programme developed by Google to bring wireless internet to rural communities using high-altitude helium balloons. The programme, called “Project Loon”, involves fitting transmitters to the balloons, which will fly at similar altitudes to Facebook’s drones. Unlike the drones, the balloons cannot be directly steered, but Google claims that, with an accurate enough model of wind speeds and directions, it is possible to effectively direct the balloons simply by raising or lowering their altitude to ensure they blow in the desired direction. Project Loon was first tested in New Zealand in 2013. Separately, Facebook a year ago launched Internet.org, an initiative to provide access to the two-thirds of the world without a reliable connection. The project, which partners with local mobile carriers to offer free internet access on basic smartphones across Asia, Africa and Latin America. But Internet.org has also been criticised by activists in both the developed and developing world for only linking users to a walled-garden version of the internet. Internet.org customers can access, for free, selected services such as Facebook, Wikipedia, weather, job listings and government info. But they cannot access the open web through the same service. In May, Tim Berners-Lee, the inventor of the world wide web, suggested that users “just say no” to services such as Internet.org.